Following up from a comfortable 7-1 home win against Garston Ladies 2nd XI in midweek with both Bianca Hedgecock and Charlene Turturici-Clarke scoring a brace each, Hemel Hempstead Town Ladies closed the gap to leaders Northwood Ladies to 3 points. Due to play Garston Ladies 1st team n Sunday their opponents forfeited the game see Hemel Hempstead awarded the 3 points and move level with the leaders. One game left away to Houghton Athletic Ladies a point or better will see them crowned Division One champions, Northwood will be cheering on Houghton. Garston Ladies 2nd XI bounced back from their midweek defeat to Hemel Hempstead to win at home against Sharnbrook WFC on Sunday and as a result move off the bottom of the Division One table. Ruby Jager scoring a hat-trick in their 6-0 victory with Lauren Berryman, Leah Crocket and Charley Kelsey also bagging a goal each. Sherrardswood Ladies go bottom having played all their games. One more Champion to celebrate this week with Hitchin Belles getting the point they needed on Sunday to become Beds & Herts Women’s Division Two Champions! Were playing their final game of the season away to local rivals and 2nd placed Hitchin Town Ladies. The match at played at Top Field home of Hitchin Town FC, Hitchin Town Ladies were 8 points behind Hitchin Belles with 3 games left to play needed a win to have any chance of denying Belles the title. In the finish it wasn’t to be with the sides battling out a 0-0 draw usually a frustrating result but not for Hitchin Belles as they win the title and promotion to Division One. Congratulations to Hitchin Belles on their title success. That 0-0 draw good news for Letchworth garden City Eagles as they move back up into 2nd place in the Division Two table with a home win over in form Evergreen Ladies on Sunday. Goals from Kate Tempest, Katie Smith, Emily Jamieson and a 1st of the season for Anna Argiros seeing Letchworth win the game 4-0, one game left to play, that against Hitchin Town Ladies now basically a shoot off for 2nd place with one point between the sides even though Hitchin have a game in hand. Three games played in Beds & Herts Women’s Division Three on Sunday and with two games left for the top 3 it is going to go down to the wire. Leaders AFC Dunstable Ladies Development top of the table were unbeaten dropping just 2 points before this weekends home clash with 3rd placed AFC Kempston Town & Bedford College Ladies. The visitors inflicting the first defeat of the season on Dunstable to close the gap to them down to 4 points. Rachael Mumford scoring a brace for Kempston Town & Bedford College with a goal each for Taylor Kingston and Kayleigh Humphries plus an own goal securing a 5-1 win. Bianca Vassell with the goal for Dunstable the pair meeting again in a fortnight in their penultimate game of the season. A win then for Dunstable putting Kempston Town & Bedford College out of the title race, if it goes the other way thing’s get very interesting on the final day! That defeat for Dunstable good news too for Woburn & Wavendon Lionesses in 2nd place as they close the gap to the leaders to just a point with a big win away to bottom side Buntingford Town Ladies. Giselle Randall on fire with 7 goals in the game taking her onto 32 goals for the season, the visitors winning 10-0 with Victoria Harrold also on target with a goal and a brace for Laura Sephton. An intriguing contest between Dunstable and Kempston Town & Bedford College in a fortnights time Woburn & Wavendon are away to Kempston Town & Bedford College in the pairs final game of the season where all three sides could all still be in contention for the title! One more game to bring you and it was victory in their final game of the season for Langford Ladies who secure a 4th placed finish in their debut season in women’s football. Were away to Biggleswade United Ladies in 5th spot. A brace from top scorer Amber Clark finishing on 25 goals plus one from Chloe Scott who ends on 21 goals for the season sealing a 3-0 win. This entry was posted in Beds & Herts Women's Division One, Beds & Herts Women's Division Three, Beds & Herts Women's Division Two, The Round-Up and tagged Beds and Herts Women's Division One, Beds and Herts Women's Division Three, Beds and Herts Women's Division Two, The Round-Up on April 17, 2019 by WFEast. Not one but two cup finals played in Cambridgeshire towards the end of last week, worthy of a mention in this weeks edition of The Round-Up. 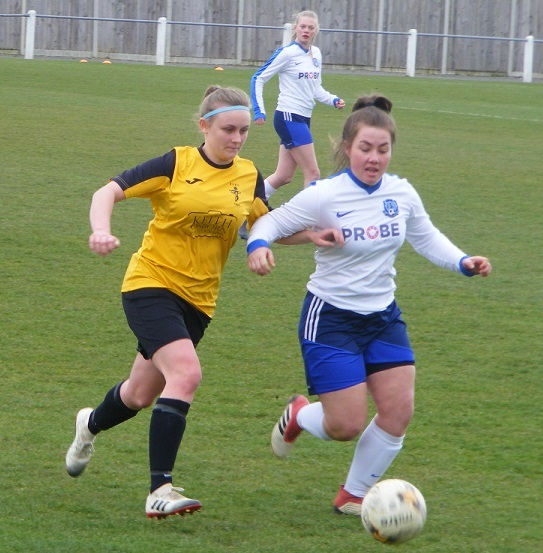 First up on Thursday it was the final of the Cambridgeshire Women’s Junior Invitation Cup, Cambridge City Ladies Development taking on Fulbourn Institute Bluebirds at Histon FC. Cambridge getting off to the better start however it was Fulbourn who opened the scoring on 15 minutes a break Marie Stubbings playing the ball on for Stacey Kemp to strike past the keeper form outside the box. The lead not lasting long with Freya Standing given time and space to line up a shot from distance the ball bouncing inside the post to make it 1-1. Midfielder Emily Reed scoring from the tightest on angles on the byline to put Cambridge into the lead. 2-1 up at half time Cambridge pressed for a 3rd goal at the start of the 2nd period Fulbourn with few chances Katie Luddy’s run and cross into the area seeing the ball presented to Stubbings at the top of the area she turned well to make it 2-2 with a clinical finish. Into the final 15 minutes a corner the ball cleared off the line the crossbar struck the ball dropping into the six yard bx players diving in the result a penalty to Cambridge. Bronte Rapley tucking it away to put Cambridge 3-2 up the goal enough to win the trophy, the first of a potential treble. 24 hours later it was the final of the Cambridgeshire Women’s Division One Cup competition played at Ely City FC, St Ives Town Ladies Development taking on Wisbech Town Ladies. The Championship North side soon on top against thier Championship South opponents, Wisbech getting forwards top scorer Sophie Swinden putting a one on one opportunity against the keeper wide. The deadlock eventually broken on the half hour Wisbech pressing the ball Chloe Stanborough carrying it into the box shooting the ball pushed wide across goal captain Faye Kowalewsky there on the follow up to nod the ball into the back of the net. Stanborough coming close again striking the bar. Wisbech remained on top for much of the game preventing St Ives getting forwards with any meaningful attacks in control but just 1 goal in it a 2nd would make thing’s more comfortable awarded a free-kick 35 yards out, Swinden over the ball goes for goal a well taken strike the ball high into the air dropped under the crossbar to put Wisbech 2-0 with less than 20 minutes to play. 2-0 the final score Wisbech Town Ladies winning this season’s Division One Cup. 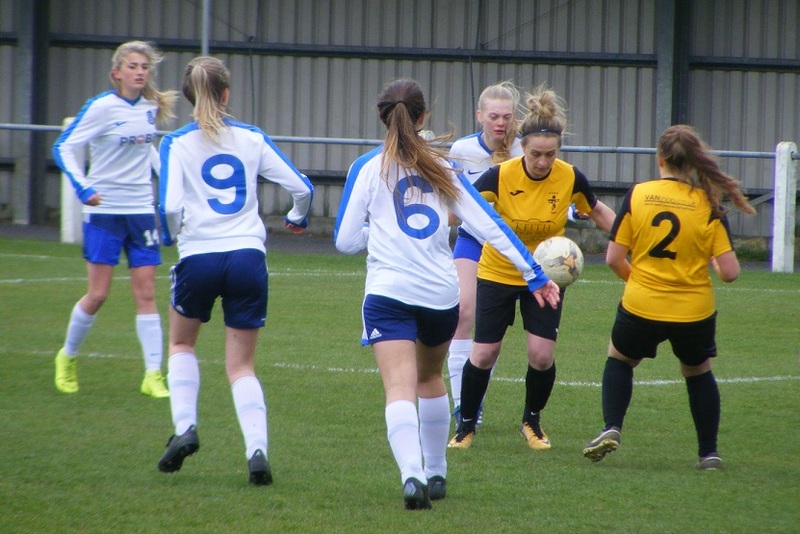 Cambridge City Ladies Development are now just one win away from secured the Cambridgeshire Women’s Premiership title as they won 7-0 at home to March Town United Ladies this Sunday. Winning the Junior Invitation Cup one win from their last 3 games will see them crowned champions and win the double with the League Cup final also to be contested in May. Megan Tonks moving onto 30 goals for the season scoring a brace against March. There were goals too for Rachel Littlewood, Anna Kanz, Lucy Hurst and Ellie Cullum. ICA Sports Ladies finished their season this Sunday with a home win against Histon Ladies Reserves, currently in 2nd position in the Premiership table 8 points clear of 3rd placed Cambridge University Women who have 4 games yet to play. Stu Afford stepping down as manager ICA Sports Ladies will be managed by Shaun Harley next season. Ended this campaign on a high goals from Jessica Farchina, Carman Herridge and Donna Nicholls securing a 3-0 win. Buoyed by a good performance in the Junior invitation Cup Final on Sunday Fulbourn Institute Bluebirds were at home to Cambridge University Women on Sunday. The bare 11 for Cambridge University they played their part in a high scoring game with the sides sharing 8 goals, Lu Liu, Bernice Wood and Amanda Wainwright on target for 3 goals for the visitors. A hat-trick from Marie Stubbings taking her onto 21 goals for the season plus a goal each for Katie Luddy and Krissie Taylor seeing Fulbourn win the game 5-3 giving them an advantage in the quest for 4th spot in the table. 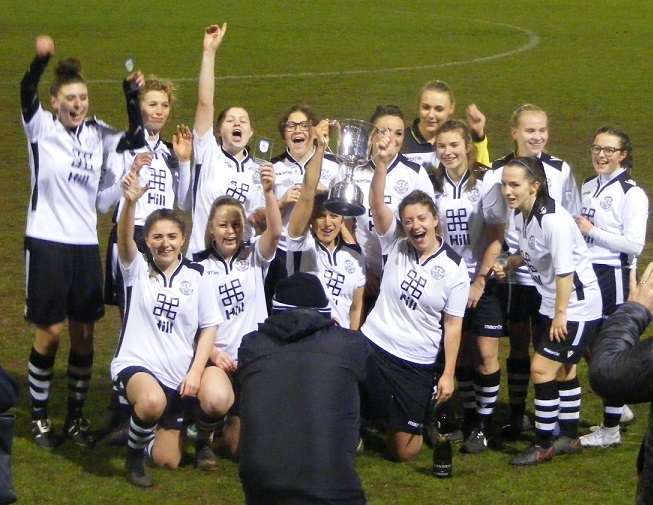 Like Cambridge City Ladies Development, Wisbech Town Ladies were soon back in action after their Cup success on Friday. Less than 48 hours later Wisbech Town Ladies were at home to Cardea Ladies. Sophie Swinden closing in on 40 goals for the season scoring a brace to take her to 38. Wisbech winning the game 5-1, Chloe Stanborough, Amy Newell and Yasmin Holmes on her debut with the other goals. A full fixture list in the Championship South this Sunday. Leaders Haverhill Rovers Ladies maintaining their 9 point lead at the top of the table with a big away win against Isleham United Ladies. Joeli Kirby well ahead in the goal scoring charts bagging herself another 4 goals to take her onto 40 goals for the season. There were hat-tricks too for Kayleigh Nolan and Abbi Griffin with Kayleigh Steed also on the scoresheet. Like Wisbech, St Ives Town Ladies Development were also in action less than 48 hours after playing in the Division One Cup final the 2nd placed side looking to keep the pressure on Haverhill with victory at home to 3rd placed Cambridge Rangers WFC got over there final disappointment creating some good opportunities to win the game 3-2 to maintain the 9 point gap with 3 games in hand. A double header this Sunday between Park Ladies at home to Burwell Tigers Ladies, two 60 minute games played as they look to get their fixtures in. 6 points collected by Park taking them 6 points clear in fourth spot. The first game won 2-0 with Sherrie Martin scoring her 14th goal of the season and Francesca Plitsch finding the back of the net. The 2nd game won by 4 goals to 2, Sophie Fenner scoring a brace with 1st goals of the season for Victoria Brown and Charlotte Tweed. This entry was posted in Cambridgeshire Women's Championship North, Cambridgeshire Women's Championship South, Cambridgeshire Women's Premiership, The Round-Up and tagged Cambridgeshire Women's Championship North, Cambridgeshire Women's Championship South, Cambridgeshire Women's Premiership, The Round-Up on April 17, 2019 by WFEast. East Bergholt United Ladies are the Champions of Suffolk for a 2nd successive season winning back to back titles. Not quite the way they would have wanted to as the 3 points were awarded after opponents Walsham Le Willow Ladies forfeited their game at the weekend. Nonetheless a fantastic achievement defending their title with a long winning streak losing just the once to 2nd placed Needham Market Women. The aim now to make it a back to back league and cup double as they look to defend the league Cup on Tues August 30th at Hadleigh FC against Needham Market Women. Congratulations to East Bergholt United Ladies on this season’s league title. Needham Market Women newly formed this season pushing East Bergholt all the way to ensure they didn’t run away with things at the top of the table a runners-up finish confirmed and they are also in the finals of both the League Cup and County Cup two great games to look forwards too. This Sunday they were at home taking on another newcomer Brettvale Ladies who have improved as the season has gone on and things are looking positive for next season. This Sunday however they were soundly beaten by Needham Market who are way out in front in terms of goals this scored in the league 114 to date 5 of those added against Brettvale. Francesca Rainbird top scorer with another goal taking her tally to 29. Amber Sparks up to 20 for the season also on the scoresheet. Abbie Wilkinson, Jemma Wessels and Nicola Anderson also getting their name on the scoresheet. Another new side this season enjoying a successful campaign are Woodbridge Town Ladies climb up to 3rd in the Suffolk Women’s Division table with a narrow 2-1 win at home against Alresford Colne Rangers. Goals for Kimberly Edwards and a 19th of the season for top scorer Jenna Liverpool securing the 3 points, strong in 2019 with just 2 defeats from 12 played. Jo Harvey scoring the goal for Alresford. Leiston St Margarets Ladies are looking good now to secure a top half finish in the Suffolk Women’s Division as they like Woodbridge enjoy a strong 2nd half to the season again just 2 defeats from 10 played so far this calendar year. Were at home this Sunday taking on Chantry Grasshoppers Ladies and despite Charlotte Archer scoring her 12th goal of the season for the visitors goals from Sarah Cooper and Justine Young saw Leiston St Margarets win the game 2-1. Coplestonians Ladies were away to bottom side University of Suffolk Women this Sunday and despite being short on numbers held a narrow lead at the break. A different story 2nd half as Coplestonians piled on the goals to win the 3 points with a 9-2 victory. Top sorer Abigail Eley scoring 4 of those goals taking her to 14 for the season. A hat-trick too for Sophie Maul with Chloe York an Lottie Aldous also getting a goal a piece. This entry was posted in Suffolk Women's Division, The Round-Up and tagged Suffolk Women's Division, The Round-Up on April 17, 2019 by WFEast. Just a handful of fixtures left now in Norfolk Women’s Division One half the sides now completing their fixtures Thorpe United Ladies long ago crowned champions, a win from Gorleston Ladies would see them clinch runners-up spot in the league as they travelled to play bottom side Beccles Town Ladies on Sunday just a point behind 2nd placed Sprowston Ladies whose fixtures were done. Two games in hand for Gorleston they were 2 goals to the good at half-time, went on to add a further 2 in the 2nd period to win the game 4-1 and seal a 2nd place finish. Samantha Hunn scoring a brace with Sophie Gillett and Beth Turner both on target for a goal each. Lucy Robbens with the 2nd half goal for Beccles who despite a spirited finish bottom of the table following promotion last season. Haven’t had the luck with injuries throughout but still have a cup final to look forwards too. Has been a difficult season too for Bungay Town Ladies double winners last season, got off to a terrible start this time around the squad taking a hit players missing, injuries, results picking up recently as new players start to find their feet bolster the existing squad end the campaign unbeaten in 3 winning two including their last game of the season at home to Sprowston Athletic Ladies the 3 points lifting them into the top half of the table. At home Bungay leading 2-0 at half-time went on to win the game 3-0. Selina Rowland scoring a brace there was a goal too for Morgan Devine. It was from Norfolk where this Sunday’s action came from Women’s Football East came from the top of Division Two a first opportunity to have a look at league leaders Taverham Women United’s young guns as they travelled to 3rd placed Fakenham Town Ladies knowing one more win would secure them the league title. Taverham with a very young side all U18 bar one making the step up from youth football often a big step Taverham drawing their opening game haven’t looked back losing just the one game and that only a month ago. Fakenham coming into the game hit by injuries and unavailability meaning they had just the bare 11. Taverham were on the front foot from the off the game soon becoming a classic of attack versus defence, Fakenham with their backs to the wall battling hard deep in their half ans Taverham poured forwards. Teigan Robinson getting the break through breaking into the area o score from the rebound to put the visitors into the lead. Chloe Easter making some vital saves in the Fakenham goal. It was more of the same 2nd half Fakenham rarely in the Taverham half, digging in battling as opportunities came and went for Taverham to put the game to bed, denied by the post, Easter again their to save, late into the game Fakenham got forwards forcing a corner on the right a goal bound shot blocked by an arm the referee pointing to the spot a last gasp chance for Fakenham to rescue a point, captain Sian Sands to take now mistake her strike just about eluding Taverham goalkeeper Laura Beevor to find the back of the net and see the game end 1-1. 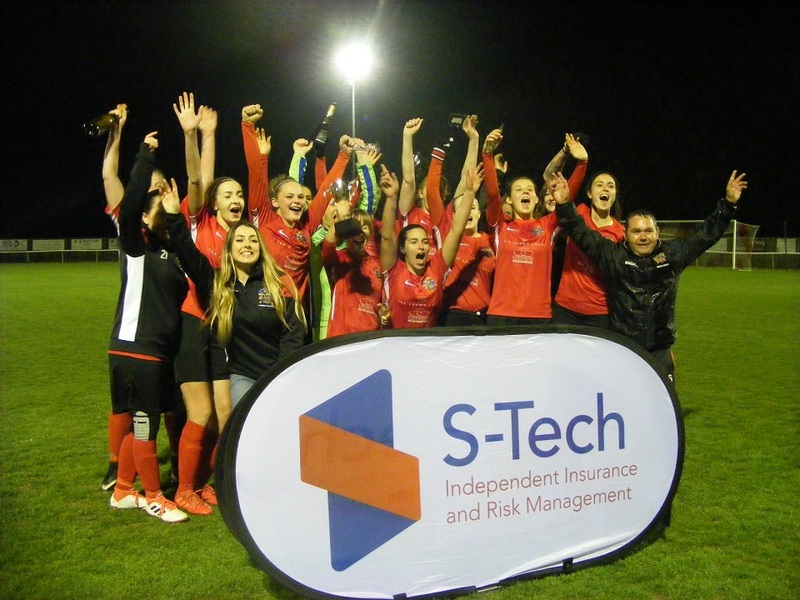 The title remains in Taverham’s hands victory in their final game of the season away to Hockering will see them crowned champions in their first season in women’s football. The battle for runners-up spot still very much alive with a 3 way tie on 37 points between 2nd placed Long Stratton Women and Fakenham Town Ladies pushed down to 4th on goal difference as Tavern Ladies nestle in between them in 3rd. A game in hand on Long Stratton too, Fakenham with 5 left to play having games in hand on both. Tavern were in action this Sunday on the East Coast taking on Gorleston Rangers Ladies. The Dereham based side scoring plenty of goals this season, none more so than Katie Hart-Copsey as she was on target once again at the weekend on fire scoring all 5 goals in the game to become the 2nd player (would have been the first but I started in Essex this week) in the East to rack up 50 goals for the season! Freethorpe Ladies move up the Division Two table once again this Sunday winning at home against Thetford Town Ladies to slot into 5th place in the table. A big win too against a Thetford side once again struggling for numbers. 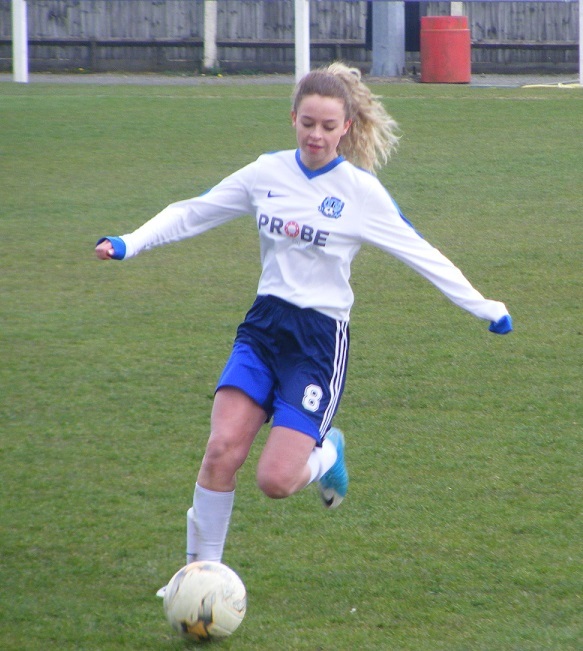 Andrea Colbrook scoring a hat-trick in the game for Freethorpe. Keira Squires on target for a brace, there were goals too for Claire Garner, Robyn Steele and a first of the season for Michaela Stordy in an 8-0 victory. At the other end of the Division One table it has been a long hard 1st season in women’s football for Bulldogs Ladies. Playing their final league game of the season this Sunday they ended on a high with a strong 2nd half shoeing against Horsford Women to claim victory for just the 2nd time this season. 2-1 up at half-time Bulldogs went on to add a further 6 goals without reply in the 2nd half to win the game 8-1. 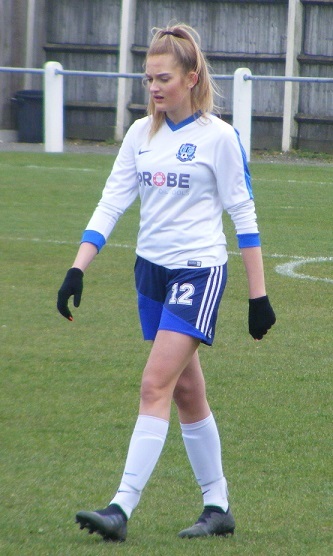 Emma Johnson scoring a hat-trick for Bulldogs. Also getting on the scoresheet were Stevie-Leigh Malkinson, Emily Hinsley, Sara-Jane Langford and Rachael Barrett with her 1st goal for Bulldogs. Lois Irving with the early first half goal for Horsford. This entry was posted in Norfolk Women's Division One, Norfolk Women's Division Two, The Round-Up and tagged Norfolk Women's Division One, Norfolk Women's Division Two, The Round-Up on April 17, 2019 by WFEast. This season’s Essex Women’s Women’s League Cup Final will see Leigh Ramblers Ladies taking on Harlow Town Ladies Development for the trophy, two young upcoming sides both doing well in the Premier Division this season. Leigh Ramblers Ladies challenging for the title itself now into the final after overcoming fellow Premier Division side Southend United Ladies in the last 4 this weekend. A challenging draw to get t the final for Leigh Ramblers taking on sides 1st. 3rd, 5th and now 6th in the Premier Division. Kate Newton, top scorer for Leigh Ramblers this season netting a brace to see them win the game 2-0 taking her to 32 goals for the season. The League Cup Final taking place on Sunday 19th may at Runwell Sports FC. 4 games played in Essex Women’s Division One this Sunday and Dagenham & Redbridge Ladies hold onto top spot for another week at least as 2nd placed Billericay Town Ladies were beaten at home to 3rd placed Hutton Ladies Reserves on Sunday. A goal form Emily Wilton along with a 10th goal of the season for Baylie Kingsnorth enough to clinch the 3 points for the visitors winning the match 2-1 with Hollie Dimambro Bovington getting the goal for Billericay. The 3 points ensuring Hutton will continue to pressure runners-up spot right until the final day with 3 games left to play. The other side that can chase down league leaders Dagenham & Redbridge Ladies are Rayleigh Town Ladies up to 4th now with 6 games still to play are 15 points back from top spot likely t be awarded several points due to opposition due to games called off are scoring plenty of goals this season. Notably Isabelle Wallings, scoring 4 at the weekend as they took on Chelmsford City Ladies Reserves at home those goals pushing Wallings onto an incredible 50 goals for the season. Wasn’t the top scorer in the game however with Eleasha Reeves on target for 5 goals to take her own tally to 23 for the campaign. Also moving onto 23 goals for the season is Holly Gash with a goal plus 2 for Kristina Stavrinou her first goals for Rayleigh Town who ran out 12-0 winners. A big game to come with Rayleigh at home to Billericay Town Ladies Reserves in a fortnights time. Belhus Ladies climb back up to 7th spot in the Essex Women’s Division One table winning at home to bottom side Island Ladies this Sunday. Goals from Aimee Hunt, Hayley Freeman and a first goal of the season for Paige Pervaill seeing them to a 3-1 win. Ebonnie Williams getting on the scoresheet for Island. The points shared in the final match to bring you from Division One this Sunday with Leigh Ramblers Ladies Reserves holding 5th placed FC Clacton Ladies to a 2-2 draw at home at the weekend. Clacton leading 1-0 at half-time Leigh Ramblers scoring twice in the 2nd half as they battled back to get a point. Stacy Bott from the penalty spot and Emily Hamlin scoring for Leigh Ramblers. Charlotte Warren scoring for Clacton her 13th strike of the season with Lucy-May Cushway also getting a goal her first for Clacton in just her 3rd appearance. Chelmsford City Ladies were at home to Frontiers Ladies in the semi-final of the Tiptree & District Charity Cup this Sunday. Two early goals for the visitors doing the damage seeing Frontiers reach the final. Anna Freeman and Jill Bartholomew with the goals to secure a 2-0 victory. 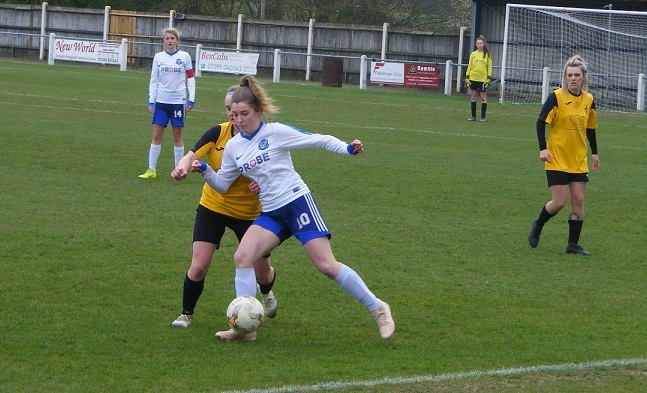 This entry was posted in Essex Women's Division One, Essex Women's League Cup, The Round-Up, Tiptree & District Charity Cup and tagged Essex Women's Division One, Essex Women's League Cup, The Round-Up, Tiptree & District Charity Cup on April 17, 2019 by WFEast. Semi-final weekend for the ERWFL League Cup down t the last 4 sides vying for a place in the final on Sunday 12th May. 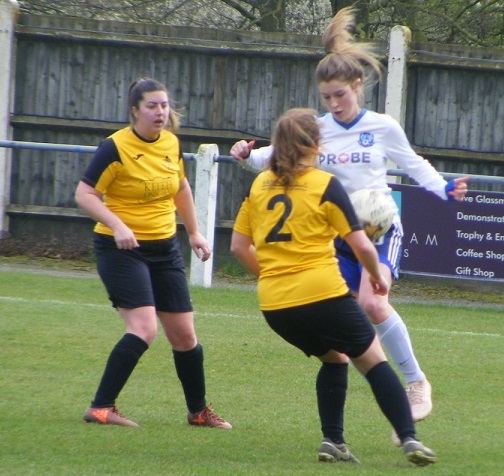 Cambridge City Ladies looking to make it a league and cup double the Premier Division Champions were at home to Essex side Harlow Town Ladies. Goals from top scorer Erin Davies, Bronte Rapley plus and own goal sealing a 3-1 victory for Cambridge City to see them into their 2nd ERWFL League Cup final in 3 seasons. Harlow not happy with some referring decisions scoring through Hannah Smith her debut goal for the 1st team after impressing and scoring plenty of goals for their Development side this season. Injuries and player unavailability affecting Peterborough Northern Star Ladies towards the end of the season, despite that have done well to reach the last 4 of the League Cup, drawn at home to play Bedford Ladies. The game officiated by Norwegian referees guests of Cambridgeshire FA this week. A close game in the finish with the game with goals from Amy Magnus and Jasmine Ajayi seeing Bedford through the the final courtesy of a 2-1 victory. Also a semi-final played too this Sunday in the ERWFL’s League Plate competition. Stevenage Ladies Reserves at home taking on Cambridgeshire side Histon Ladies. The away side taking an 18th minute lead a corner returned into the area met by Katie Seagrave her header beating the keeper from close range to make it 1-0. Stevenage quick to reply level just 4 minutes later breaking with Histon appealing for a foul up the other end, Sherrie Evans getting the goal to make it 1-1. All square the game remained heading into extra-time. Histon winning the game in the 1st period of extra play, Kaya Haq scoring a superb goal from a 25 yard free kick sending a curled ball high to drop into the back of the net to send Histon into the League Plate final. 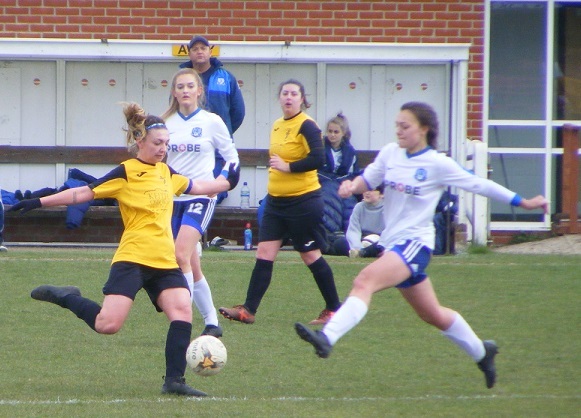 Their opponents with be either Newmarket Town Ladies or Hoddesdon Town Owls Ladies who met in the league this Sunday setting their semi-final up nicely. 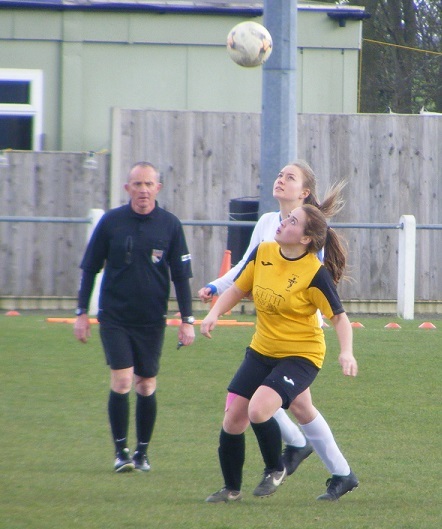 Royston Town Ladies returned to winning ways this Sunday in the ERWFL Premier Division as they look to secure the runners-up spot in the league. The 2nd placed side at home to Haringey Borough Women. Royston taking the lead from the penalty spot Jo Rutherford making it 1-0, added a 2nd to double the lead with Eva Ramsey scoring from out wide to make it 3-0 Haringey puling a goal back before the break their keeper making some important saves to limit Royston to 3 goals. Francesca Smithers returning to action for Royston on target to bring up their 4th goal, Rutherford lobbing the keeper to complete her hat-trick to bring up her 19th goal of the season and see Royston win the game 5-1. A home win too for Colney Heath Ladies against Brentwood Town Ladies on Sunday, goals from Charlene Moreton and Rianne Townsend-Brown securing a 2-0 victory the 3 points lifting Colney Heath over the Essex side into 8th position in the Premier Division. With ERWFL Division One leaders St Ives Town Ladies not in action this weekend it was an opportunity for 2nd placed Bowers & Pitsea Ladies to close the gap down to just 3 points in preparation for the two sides meeting this coming Sunday. A tough local derby this weekend away to fellow Essex side Hutton Ladies. Bowers & Pitsea in good form however unlucky in 13 games in the league a single goal winning a tough battle between the sides Sophie Dowman’s 14th goal of the season extending the run to 14. A trip to St Ives now where they will be looking to end the league leaders unbeaten record. 2-2 when the sides last met in the league Newmarket Town Ladies 3rd in Division One were away 5th placed Hoddesdon Town Owls Ladies. Goals from Rosy Wodhams and Becky Scola seeing Hoddesdon into a 2-1 lead with 25 minutes left Newmarket then reduced 10 with goalkeeper Dominika Szary sent off being adjudged to have handled the ball outside the area. Yasmin Woodfield donning the keepers gloves Newmarket having scored through Annabel Cuthbert kept battling getting themselves back on level terms Cuthbert with her 10th goal of the season, the visitors dramatically winning the game with seconds left on the clock Cuthbert lobbing the keeper to complete her hat-trick. The two sides meeting at Newmarket this coming Sunday in the League Plate semi-finals haven’t yet seen both this season and this is where I shall be. A big win for King’s Lynn Town Ladies at home this Sunday as they continue to build momentum going into the Norfolk Women’s County Cup final in just a fortnights time. This Sunday they were playing at The Walks home of King’s Lynn Town FC, taking on Hatfield Peverel Ladies. A strong first half performance seeing King’s Lynn leading 7-0 with hat-tricks for both Oksana Imanalijeva and Tiffany Forshaw along with a goal for Jodie Hopkins-Duckhouse. A further two goals added in the 2nd half with Becky Russell scoring and Imanalijeva getting a 4th to her name. The win taking King’s Lynn into 7th and in a great position to challenge for a top half finish. Lawford Ladies were at home this Sunday in ERWFL Division One taking on bottom side Bishops Stortford Ladies. The hosts winning the game 3-1 thanks to goals from Stacey Teager, Jodie Sharp and a 1st of the season for Claire Gauntlett. Again like King’s Lynn well placed to push on up the table in their final 4 matches. Poppy Kelly scoring the goal for Bishops Stortford. This entry was posted in ERWFL Division One, ERWFL League Cup, ERWFL League Plate, ERWFL Premier Division, The Round-Up and tagged ERWFL Division One, ERWFL League Cup, ERWFL League Plate, ERWFL Premier Division, The Round-Up on April 16, 2019 by WFEast. Not one but two champions crowned this Sunday in the FAWNL, 3 in fact cause I’ll get wrong if I don’t mention Burnley FC Women who were also title winners at the weekend winning the Division One North title. Over to the FAWNL covered by Women’s Football East Coventry United Ladies and Crawley Wasps Ladies got the wins they needed to become champions of the Southern Premier Division and South East Division One respectfully. Starting with the FAWNL Southern Premier Division, they have been amongst the title challengers for a number of season’s now and at last Coventry United Ladies are there top of the pile can’t be caught despite the late threat posed by Cardiff City Ladies racing up the table into 2nd spot. Just the one defeat in the league for Coventry a 10 point lead going into Sunday’s game at home to Cardiff with the reverse fixture to come as games in hand for the Welsh side, Coventry were in pole position knowing the win would secure the title. An early goal from Jade Brook scoring in the 7th minute putting Coventry into the lead. Cardiff levelling the scores 10 minutes later with Kylie Nolan finding the back of the net to make it 1-1. Coventry retaking the lead in 27th minute Amy Wathan heading home a Brook cross. A narrow advantage at the break so it remained for all of the 2nd half until Wathan struck again in injury time to giving Coventry some breathing room that dispelled a minute further into stoppage time with Marie Gauntlett scoring a wonder goal to see the game won 4-1 and the celebrations commence. 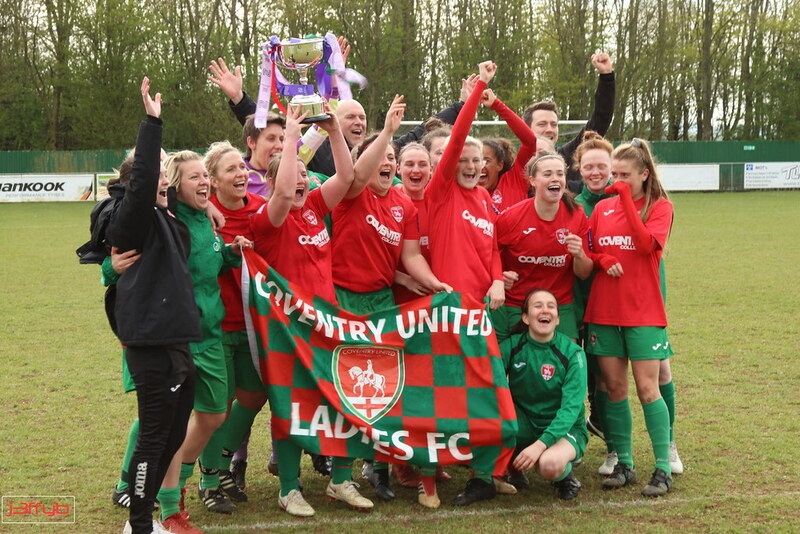 Many congratulations to Coventry United Ladies on their title success, FAWNL Southern Premier Division Champions. Defeat for Cardiff ending their own slim title hopes they slip back to 3rd with Chichester City Ladies winning at home on Sunday to return to 2nd. Were taking on Watford Ladies. A single goal enough to win Chichester the 3 points their 14th win of the campaign. The goal coming late in the 1st half with Lauren Cheshire scoring from the penalty spot. A lat winner saw 4th placed Oxford United Women clinch the 3 points at home to Portsmouth FC Women this Sunday in the Southern Premier Division. Goalless after the 1st 45 minutes Oxford going on to open the scoring early in the 2nd half, Georgia Timms fouled inside the box stepping up to score from the resulting penalty kick to make it 1-0. Katie James firing home from a free-kick giving the keeper no chance to make it 1-1 in the 56th minute. Into the closing minute the scores still locked at 1-1 a ball played into the box from wide met perfectly by Emily Allen to volley home inside the six yard box to make it 2-1 and win the game for Oxford with her 17th goal of the season. Less than 48 hours after winning the County Cup in Devon, Plymouth Argyle Ladies up in the Midlands to play Loughborough Foxes Women in the league. Plymouth looking to continue their recent good form unbeaten in their last four in the Southern Premier Division, back to back wins looking for a 3rd Natasha Knapman firing them into the lead on 30 minutes. Loughborough with a quick reply Rebecca Knight equalising 3 minutes later. Level at the break Helen Bleazard scoring a minute after the restart to put Plymouth back into the lead. Jessie Charlotte Cooper pulling it back to 3-2 for Loughborough with 12 minutes left to play Jones adding her 2nd of the match sealing the win for Plymouth in the final minute 4-2. 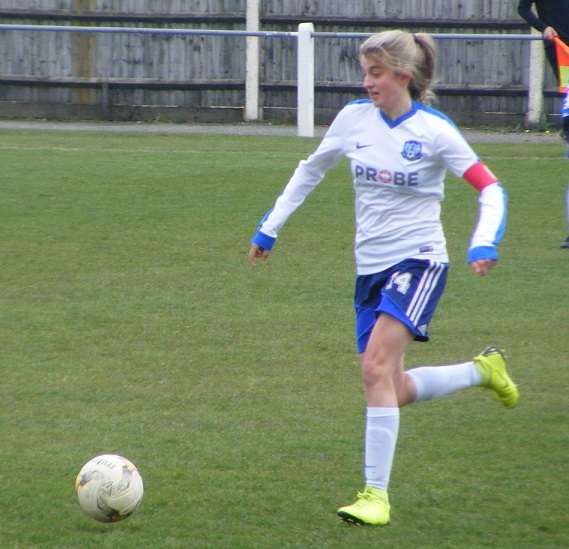 Finally in the Southern Premier Division this Sunday it was a contest between the bottom two with Queens Park Rangers Women hosting C&K Basildon Ladies. both still without a win in the league going into the match. C&K Basildon taking an early lead 1-0 up inside 2 minutes Holly Turner capitalising on a defensive error to score. QPR getting the equalising goal late in the 1st half with Jo Wilson rounding the keeper in the 37th minute to make it 1-1 at half-time. The hosts taking the lead early in the 2nd half a 2nd of the game for Wilson firing home a long range effort. Wilson going on to complete her hat-trick with less than 20 minutes to go. The final score 4-1 with Sue Kumaning getting her name on the scoresheet. Finally a win for QPR. Basildon relegated to South East Division One have endured a difficult season, the club knowing it would be a struggle coming together, the squad growing in adversity battling week in week out. 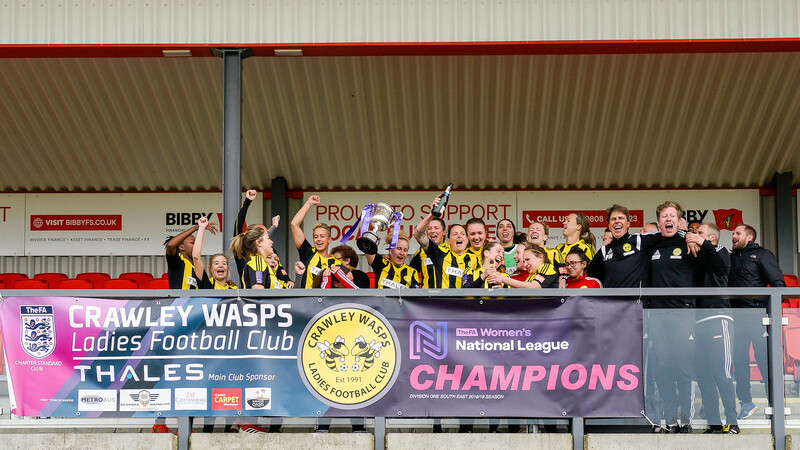 One win needed too for Crawley Wasps Ladies in South East Division One to win successive promotions, champions and fully deserved have lead the way from start to finish a 100% winning record long held. Tipped for the title by everyone I spoke including fellow clubs in South East Division One brief visitors on their way to the Southern Premier Division. Billericay Town Ladies briefly putting the celebration on hold the Essex club in 2nd beating Crawly for the 1st time in the FAWNL, they were here again at home knowing victory would see them finish champions, were taking on Enfield Town Ladies who have enjoyed a strong season themselves and were holding Crawley to a goalless scoreline going into the final 10 minutes, the winning goal finally coming in the 83rd minute a great pass from Naomi Cole sending Kemina Webber through into the box to send the ball into the back of the net and win the game. Congratulations to Crawly Wasps Ladies on winning FAWNL South East Division One. 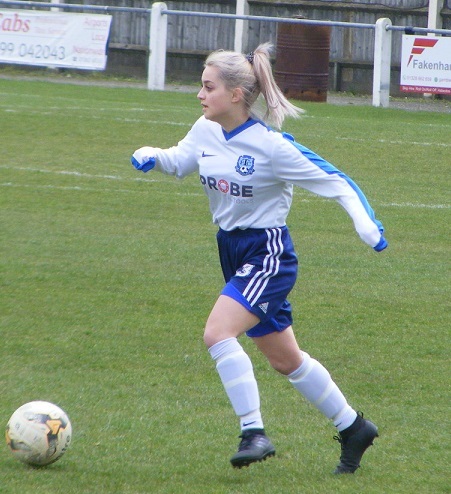 Billericay Town Ladies finish runners-up in FAWNL South East Division One like Crawley making their FAWNL bow this season the Essex club recruiting well for life playing at a higher level neck and neck with Crawley early on. Kin Coster’s side were at home this Sunday taking on Cambridge United WFC in good form recently themselves. Drawing 1-1 at the half-time interval Billericay found the winning goal 2nd half to win the game 2-1 to secure the 3 points to guarantee 2nd spot. Danica Dougal and Zoe Rushen with the goals. Next up the Essex Women’s County Cup final this Thursday against C&K Basildon Ladies at Bowers & Pitsea FC. Cambridge’s goal scored by Mollie Coupar who moves ahead as top scorer with 12 goals for the season. A dramatic match between 3rd and 4th in the South East Division One table with Actonians Lades hosting Leyton Orient WFC. An early lead for the visiting side with Danielle Griffiths putting them 1-0 up in the 5th minute from the penalty spot. Actonians straight back into it Carla Williams with the goal to make it 1-1 a minute later. Actonians going on to take the lead in the 34th minute with Williams on target for her 2nd of the game. A late save from Paige Horsnell keeping it at 2-1 at half-time. Actonians striking the crossbar early in the 2nd period Leyton Orient coming back to make it 2-2 with 55 minutes played Valeria Moreno with the goal. 4 minutes later the visitors were in the lead Sophie Le Marchand scoring to make it 3-2. Just 3 minutes left on the clock and Actonians came back to level it a 3-3 to see the points shared, Alessandra Barreca netting for the 25th time this season. A fantastic start for Ipswich Town Women at home to Stevenage Ladies with Natasha Thomas scoring against the Hertfordshire side in the opening minute. Stevenage getting back into the game responding well coming back to level in the 21st minute Ellie Searle with the goal to make it 1-1. Level at the break the visitors were awarded a penalty within a minute of the restart, Erin Pope converting from the spot to make it 2-1. Ipswich found themselves down to 10 on the hour with Jordan Arnoup sent off. Despite that Ipswich pushed for a goal levelling the game with 5 minutes to go Lindsey Cooper scoring to rescue a point. Hope yet for Luton Town Ladies at the bottom of the league as they win for just the 3rd time this season to close the gap to 2nd bottom Denham United Ladies to 3 points with a game in hand and superior goal difference. At home this Sunday were taking on Norwich City Ladies. Goals from Rachel Kosky and Remi Bains seeing Luton holding a 2-0 lead at half-time. Norwich reducing the deficit with 20 minutes to play, Kathryn Stanley scoring from out wide. Luton defending held out to clinch the win and claim 3 vital points. This entry was posted in FAWNL South East Division One, FAWNL Southern Premier Division, The Round-Up and tagged FAWNL South East Division One, FAWNL Southern Premier Division, The Round-Up on April 16, 2019 by WFEast. A return to league action this afternoon on Women’s Football East a short trip today to Clipbush Park to watch a crucial top of the table clash from Norfolk Women’s Division Two leaders Taverham Women United one win away from clinching the title in their debut season away to Fakenham Town Ladies in 3rd whose own title hopes rest on winning the 3 points themselves. Due to be played back in December had it on the radar but the weather put pay to that outing, the rearranged fixture falling just right, both sides starting the season well under contrasting circumstances. Fakenham Town Ladies relegated from Division One looking to regroup and rebuild confidence within their squad. Taverham Women one of a cluster of youth sides making the big step up to women’s football this season. The two clubs neck and neck at the top of the table in the early stages of the season, both unbeaten Fakenham winning their opening 8 matches before the two sides met at Taverham in December, Taverham ending Fakenham’s 100% winning start in a close match winning 1-0. Since then Fakenham have fallen behind with fixtures hit by postponements and call offs have 6 games left to play. Injury and unavailable players affecting them too in the run in, 4 games in hand on Taverham down to 3rd now after a 2nd defeat of the season against Long Stratton Women in 2nd know they can’t afford to lose today if they want to finish top of the pile. Taverham making the step up into women’s football this season has seen several sides struggle to adapt recently, not in their case however their young squad all under 18 bar one Rebecca Sutton who is 18 hitting the ground running a 0-0 draw on the opening day went on to win their next 13 league matches before suffering their first and only defeat of the season to an in form Tavern Ladies side last month. An important 3-0 away win in midweek against Long Stratton Women sees them 12 points clear at the top knowing a win against Fakenham will see them clinch the league title. Taverham have a small close knit squad 16 players, manager Kevin Robinson with the squad since they were playing at U10 level, with 5 of that team still with the current group. Well supported by joint manager Bill Artis along with all the parents that make it a real family unit. Have scored an incredible 123 goals so far this season with Rebecca Sutton and Abbie Walker sharing 66 goals between them. Learning every game and with some strong sides in the league a credit to be where they are with two games left to play. Clipbush Park the venue this afternoon the ladies side sharing the main pitch with the mens side. A bar also serving tea and coffee along with hot food upon entry leading out onto the pitch a large surface plenty of width fitness levels need to be sharp. A seat stand along the opposite side of the pitch, a few dark clouds around a few spots of rain in the are sunny but chilly, took advantage of the cover just in case. Just the bare 11 available for Fakenham with players out injured or unavailable, Taverham naming just the one substitute. Fakenham to kick-off the 1st half wearing amber shirts with black upon the sleeves, black shorts and socks. Taverham kitted out in white shirts with blue trim, blue shirts and white socks. The ball pressed straight away in the middle pops wide for Megan Spurrell to bring on down the right support inside from Holly Davies her diagonal pass driven into Jennifer Codman getting forwards to the top of the area she knocks the ball on into the box, the Taverham defence able to let it run out for a goal kick. Taverham attack down their right the ball put on for Charlotte Hurren her cross swept into the area headed clear by Jemma Riches for Fakenham. Taverham pressing the ball high up the pitch a ball knocked forwards into the area, goalkeeper Chloe Easter trying to let it run out for a goalkick Teigan Robinson giving chase managing to win her side a corner, a good delivery in from the left towards the far post Karina Townsend getting it away for Fakenham. A positive start from Taverham very much on the front foot getting players forwards rapidly a throw high on the right Robinson crossing inside the box deflected out to the top of the area a shot drilled back in runs low wide of goal. Fakenham look to make ground on the left wing Tara Betts playing the ball on for Sam King, Jasmin Snelling putting the foot in to win the ball back for Taverham. Taverham full of energy pressing the ball ready to attack at will Fakenham pushed back into their box defending a two v two situation opening up as Taverham counter attack Sutton with the ball at her feet carrying it forwards left Robinson central tries to lift the ball into the box for her but too much on the ball Easter can let it go for a goal kick. Fakenham captain Sian Sands in the heart of the defence getting across to win the ball put it out for a throw in as Abbie Walker attempts to hook the ball on for Sutton down the flank. Summer Rogers nipping in to rob the ball from the Fakenham defence 25 yards out pushes it into Sutton inside the area, can’t get it out from her feet and turn to shoot before being closed down. Taverham continue to press the attack a through ball threaded in behind sees Sutton clear on Chloe Easter coming to close her down making a great blocking save at her feet to push the ball away for a throw. The Fakenham defence putting themselves under pressure trying to play it out from the back with the Taverham attackers lively. Taverham captain Hannah Artis receiving the ball from a throw on the right plays a cross long into the area Sands getting her head on it to put it behind for a corner. The ball in from the left defended near post another corner this delivery dropping into the six yard box Maya Lawlor getting her head to it stooping a deflection knocking it wide.The attack Taverham’s early on Fakenham working hard to defend not creating anything up the other end. Walker and Hurren switch flanks. Lucy Staff stopping Spurrell as she tries to get in to cross wide right. A handball spotted in midfield a free-kick top of the circle for Taverham, Snelling to take a great ball played in towards the top of the area, Rogers meeting it twisting her neck to head the ball goalwards her attempt bouncing wide of the right post. Fakenham busy in defence, Townsend sliding in gets the ball from Walker as she races forwards on the right. Ellie Websdale holding Hurren up on the left as Spurrell gets back to help her out. Robinson clipped as she drives forwards centrally a free-kick awarded 20 yards out Sutton over it gets a shot in past the walk, Easter gloving it down her defence back following it in getting it away Taverham collecting it a shot from 25 yards out racing wide across goal. Taverham win a throw high on the left played quickly into Sutton she turns taking the ball on into the area level with the six yard box gets her foot over the ball to hit a shot in the ball bouncing wide across the face of goal. Taverham make a change Hurren the player coming off on comes Laura Jones. Fakenham with a rare attack Spurrell with the ball n the right played inside to King coming across to make herself available, Caitlyn Arnup on her shoulder the pair battling inside the area the defender winning the tackle, play brought back however for a foul on the edge of the area. Patten over it tries to lift a shot in near post the attempt off target. Rogers latching onto the ball 20 yards out after Fakenham fail to clear sends her strike over the crossbar. Fakenham with a free-kick out wide on the right Patten to play it in towards the top of the box King up knocks it down into her feet is quickly closed down by the Taverham defence can’t get a shot away. Fakenham seeing a little more of the ball in the latter stages of the 1st half having soaked up alot of pressure. Robinson looking a constant threat in attack for Taverham attacks right cutting into the area Riches with a great tackle to deny her. GOAL! The pressure from Taverham in attack finally bringing them a goal late in the 1st half, up the pitch on the right a throw won the ball put inside to Robinson she turns carrying the ball into the box the angle tight six yards out blasts a shot in Sands defending getting a leg out to block the rebound however falls straight to Robinson her 2nd attempt played past the defender across goal into the bottom corner 0-1. A chance to double the lead straight away the ball won by Rogers put on for Walker in behind right side one on one with the keeper attempts to lift the ball over her succeeds but her effort drops wide of the mark. Artis winning most of the aerial balls Fakenham try to put on through the middle. King with the ball at her feet willing to take players on, the Taverham defence proving very difficult to shake off. Half-time, Taverham leading 1-0 a narrow advantage for all their attacking player have shown plenty of energy and positively getting numbers forwards in attack have had their opponents on the back foot for the entire 1st half. Just the one goal to show for it however the game far from settled a 2nd goal most definitely needed, Fakenham have battled hard in defence to keep Taverham at bay whilst creating very little in attack themselves. Taverham to get the 2nd half underway a change made Hurren back on Robinson off. Get forwards right from the off Lawlor played through into the box on the right blasts a shot in towards the near post Easter with a fantastic save to push the ball behind for a corner kick. The ball delivered into the box Fakenham just about deal with it knocked outside the area a shot back in well wide. Taverham starting the 2nd half off where they left the 1st have Fakenham penned inside their own 18 yard box. The pressure relieved as Fakenham are awarded a free-kick 40 yards out from goal, Sands to play it in towards the top of the area, Artis sticking out a leg to stop it. Sutton carrying the ball on down the right Sands across tackling well to deny her the opportunity to cross. Websdale winning the ball at right back for Fakenham on for Codman in the middle, Davies making a run ahead of her, Rogers sliding in to intercept the pass. King attacking on the ball left comes inside Arnup on her shoulder pushes her across the top of the area checking back King lifts a cross into the box headed clear falls straight to Codman a good 35 yards out takes on the shot the strike safely claimed by Beevor in the Taverham goal. Taverham full of running first to most balls, Spurrell on the right for Fakenham up ended a free-kick played in central, Arnup in ahead of King, Taverham counter Sutton wide playing the ball inside right looking for Sutton, Riches with a timely interception. Taverham come again on the right Walker on the ball taking players on getting into the box lays it inside for Lawlor to take on towards goal shoots looking to play the ball across the keeper from where I’m standing it looks in all the way right behind it, but for Easter a great piece of glove work getting down to palm it wide. Taverham bring Robinson back on for Jones. Spurrell plays the ball on for Davies right in behind the full back too much on the pass allows Artis to get across and clear. Townsend with a great tackle to deny Robinson as she turns inside towards the top right corner of the area before she can line up a shot. Remains 1-0 for all their possession and attacking play Taverham haven’t put the game to bed Fakenham continue to battle hard have very little of the attack but one chance taken changes everything. Hurren with a dangerous run in from the left flashes a cross along the top of the area a shot taken the Fakenham defence throwing bodies in to block. Walker coming inside from the right up against Townsend and Riches squeezes a ball between the pair on for Robinson in behind spins into the shot 8 yards out her strike running wide across the six yard box. Close again from Taverham the base of the post denying them a 2nd goal a cross put in low from the left met at the near post by Walker inside the six yard box. Taverham have a a small but passionate group of supporters vocal encouraging them on. Walker a threat on the wing cuts into the area right six yards out the ball pushed on for Lawlor she shoots, Easter getting across to cover her near post saving brilliantly again the ball behind for corner. The corner played in long to the far post Robinson under it lifts a shot up over the bar. Taverham regain possession high up the pitch Fakenham struggling to get out of their own half a corner won on the right the delivery in central headed up onto the roof of the net, that 2nd goal won’t come. Codman is down for Fakenham struggling with an injury having taken a knock has to come off for treatment with no substitute to bring on are down to 10. Townsend too taking a blow down but can continue. Hurren an excellent dribbler of the ball at speed bombs forwards into the box on the left closing in on the byline checks back attempts to lift the ball in across the face of goal, no one to meet it runs wide. Codman is back on Fakenham back up to their full compliment. Davies is upended as she tries to bring the ball on up the right for Fakenham, the ball played on down the line quickly King after it, gets a cross into the area no one gambling however, Taverham bring it out from the back lost however deflected into Spurrell’s feet she lifts a shot back in from distance, Beevor safely gathering. A rapid attack launched the ball helped on through to Sutton wins a corner on the left as Websdale comes to close her down. The delivery in central headed away by Sands for a 2nd corner. This time the ball lands at Walkers feet six yards out a snap shot cleared on the line put out to the left players attracted to the ball the cross in over them all, Townsend doing a good job in front of goal to get the ball away before it can be attacked. Taverham continue to attack another corner won on the right, have played in some great deliveries again to the far post Robinson meeting it her attempt blocked on the post. Into stoppage time Fakenham get on down the right Spurrell with King combining wining a throw put on down the line for King she does well to win a corner. The ball played in central a shot driven in towards the back post blocked on the line, hand ball! The referee pointing to the spot late drama PENALTY! GOAL! 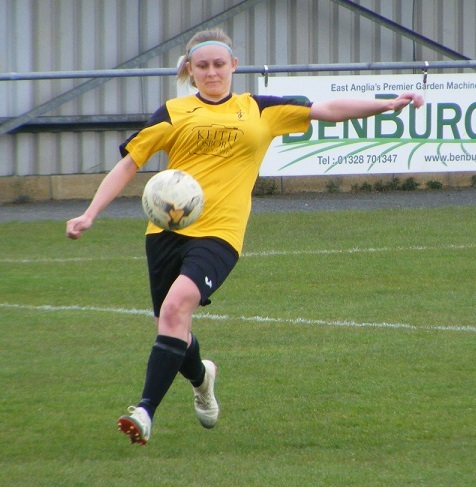 Fakenham captain Sian Sands placing the ball on the spot. The whistle blows a confident hit lifting the ball to the right pace on the ball Beevor gets a touch throwing herself in that direction but not enough to keep it out Fakenham level at the death 1-1. That’s it not time for Taverham to find a response robbed of the 3 points needed to win the title in the closing seconds of the game, Fakenham ecstatic having battled so hard all game to take a point from the match. That was most definitely a game off attack versus defence Taverham on the front foot right from the off getting forwards in numbers pressing the ball high and keeping a high level of energy throughout, taking the lead late in the first half had numerous chances in the 2nd half to put the game to bed but none were taken. Fakenham battling hard with the bare 11 players out of position defending battling and working hard to keep Taverham at bay, Easter pulling off some fantastic saves. At 1-0 they were never out of the game and in the end that cost Taverham all 3 points with a late penalty conceded and dispatched. Fakenham keep there title hopes alive for now but a win for Taverham in their final game of the season will be enough to see them win the league away to Hockering. This point meant alot however to Fakenham and they can use it to spur them on for their remaining 4 games, promotion still not guaranteed some important games still to come. Onto this afternoons Women’s Football East – Player of the Match, certainly a tough one to narrow it down to one but I’ll do my best. Abbie Walker a real threat on either wing for Taverham getting forwards and creating opportunities for herself and others in front of goal, Summer Rogers in the middle put in some good tackles was the player more often than not keeping Fakenham penned back in their own half. For Fakenham it was a battling display back to the walls with the bare 11 but credit to them especially the back for and Chloe Easter in goal making some great saves. Have chosen Sian Sands a captains performance at the heart of defence and of course the scorer of the all important penalty. Good to see both sides in action especially Taverham my first look at them having done enough positive reports in The Round-Up all season, appreciate the help form both teams this afternoon. 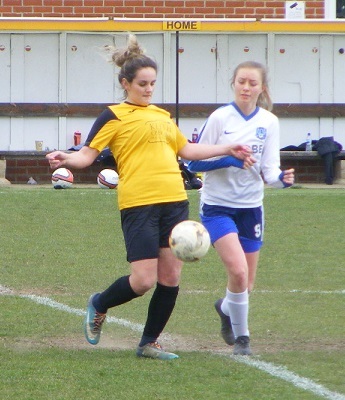 This entry was posted in Match Reports, Norfolk Women's Division Two and tagged Fakenham Town Ladies, Norfolk Women's Division Two, Taverham United Women, The Round-Up on April 14, 2019 by WFEast. The race for the title in Beds & Herts Women’s Division One looks like it will go all the way now in what has been an intriguing title race at the top of the table all season. Northwood Ladies the first side to complete their fixtures ending on a high sitting top of the table with a crucial 1-0 home win over 2nd placed St Albans Ladies on Sunday, that win taking Northwood 4 points clear of St Albans Ladies meaning they can’t catch the with one game left to play. Runners-up to St Albans Ladies in their debut season last year Northwood are guaranteed a top two finish this time around too. Leanne Jones scoring the all important winning goal. As intriguing as the title race in Beds & Herts Women’s Division One has been, there was always likely with their games in hand over their rivals and suffering just the one defeat all season that Hemel Hempstead Town Ladies would come through to take top spot, that though looks less certain now after they suffered a surprise defeat away from home on Sunday to bottom side Garston Ladies 2nd XI. A brace from Ruby Jager along with a goal for Charley Kelsey seeing Garston Ladies fresh from reaching The Chris Renshaw Trophy final beating Hemel Hempstead 3-1. Amy Bentall scoring the goal for the visitors, the title remains in Hemel Hempstead’s reach with 3 games left to play but can’t afford any more slip ups with the gap to Northwood 6 points. A good weekend all round for Garston Ladies women’s sides as their 1st team extended their unbeaten run in league and cup to 6 matches building on a midweek win away to Sherrardswood Ladies to beat Sharnbrook WFC at home this Sunday. A 2-1 win in midweek, Garston scored 2 without reply on Sunday to pick up the 3 points and climb up a place to 7th in the table. Home wins awarded to the top two in Beds & Herts Women’s Division Two the title battle almost over. Hitchin Belles top of the table leading by 9 points with a game left to play, that match away to 2nd placed Hitchin Town Ladies this coming Sunday. A positive result for Hitchin Belles seeing them finish champions, promotion to Division One for the 1st time assured. Even a win for Hitchin Town may not be enough as even with maximum points from their last 3 games will see the sides level on 44 points Hitchin Belles with a usual 19+ goal difference as it stands. A fantastic season for both an Sunday’s game sure to be a special day played at Hitchin Town FC’s Top Field stadium. One game played in Beds & Herts Women’s Division Two on Sunday, a thriller between Evergreen Ladies & Watton Ladies sharing 9 goals, Watton bringing an end to Evergreen’s winning streak. Both sides short on a full compliment of players Natalie Maher on target with a brace for Evergreen has 14 goals now for the season with Top scorer Rebecca Freeman staying 1 ahead of her on 15 with a goal, Lisa Nolan also getting a goal. 4 though wasn’t enough for Evergreen to take anything from the game as a brace from Gemma Bickell taking her to 10 for the season and a hat-trick from Sian Owens also on 10 goals no seeing Watton clinch the win 5-4. Three games in Beds & Herts Women’s Division Three this Sunday and with leaders AFC Dunstable Ladies Reserves not in action it was a chance for 2nd & 3rd placed Woburn & Wavendon Lioness & AFC Kempston Town & Bedford College Ladies to close the gap exert some pressure leading into the final 3 games of the season. Woburn & Wavendon Lionesses at home to Bedwell Rangers Ladies this Sunday, Nikita Blackburn scoring a brace for the hosts her 1st goals of the season. Kodi Meader and Victoria Harrold celebrating a goal each too along with top scorer Giselle Randall finding the back of the net for the 25th time this season as Woburn & Wavendon Lionesses won the game 5-2 to close the gap to Dunstable back to 4 points. Jessica Sullivan and Georgia Miller scoring the goals for Bedwell Rangers playing their last game of the season. AFC Kempston Town & Bedford College Ladies were also at home this Sunday taking on Stotfold Juniors Ladies in Division Three. Bex Cray top scoring in the game with 4 for the hosts moves her onto 18 goals for the season. AFC Kempston Town & Bedford College winning the game 7-2 with Emily Devereux, Rachael Mumford and Danielle Cherry all claiming a goal each, Cherry’s first of the season. The 3rd placed side closing the gap to AFC Dunstable to 7 points, the two sides have to play each other home and away in their final 3 games, with their final game at home to Woburn & Wavendon Lionesses those games could well have a big impact on the title. 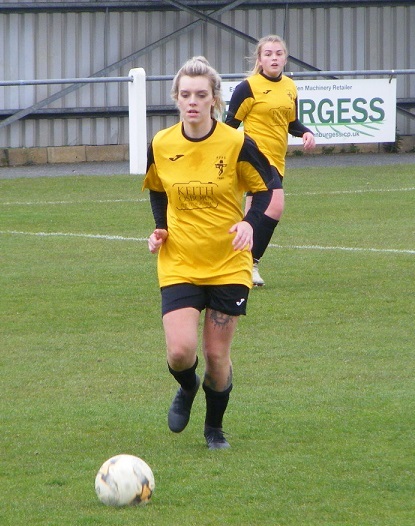 A hat-trick from Amber Clark enough to see 4th placed Langford Ladies win the 3 points at home to Kempston Rovers Ladies on Sunday in Division Three. The hosts edging the win by 3 goals to 2, Clark out in front as top scorer for Langford now with 23 goals. Meghan Dimmock and Chelsea Rose Jeffery scoring for Kempston Rovers. This entry was posted in Beds & Herts Women's Division One, Beds & Herts Women's Division Three, Beds & Herts Women's Division Two, The Round-Up and tagged Beds and Herts Women's Division One, Beds and Herts Women's Division Three, Beds and Herts Women's Division Two, The Round-Up on April 10, 2019 by WFEast. Harlow Town Ladies Development are the first side to reach the final of this season’s Essex Women’s League Cup. Their young side enjoying an impressive debut season in the Premier Division 4th in the table a long unbeaten run at the start of the season now into their 1st ever final. Were away to Division One side Runwell Sports Ladies who have been League Cup finalists themselves losing to Harlow’s 1st team 3 seasons ago. Harlow’s Development side enjoying a good first half showing to lead the game 3-0 built on that 2nd half adding a further 5 goals to book their spot in the final with an 8-1 win. Top scorer Hannah Smith on target for 4 of those goals taking her goals for the season up to 27. Ellie Nicholls also on the scoresheet with her 18th goal of the season with a goal each to for Maisy Wyer, Evie Anderson and Savannah Japal. Leigh Ramblers Ladies are at home to Southend United Ladies in the other League Cup semi-final taking place this coming Sunday. Collier Row Tigers are up to 3rd spot in the Essex Women’s Division after picking up the 3 point in an impressive win away to 4th placed Chelmsford City Ladies on Sunday. 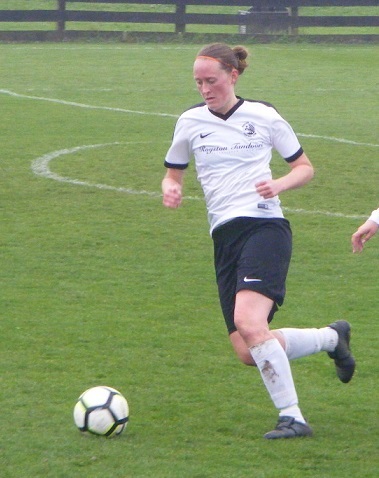 Top scorer Laura Bunton racing past the 30 goals mark with a 5 goal haul that sees her on 31 goals from just 12 appearances. Collier Row Tigers winning the game 6-0 with Emma Harrison the other goalscorer. A 5th straight league win for Southend United Ladies sees them consolidate 6th position in the Essex Women’s Premier Division and with games in hand on the sides above them could yet push for a top half finish after a slow start to the campaign. Were in the road this Sunday taking on Beacon Hill Rovers Ladies. Jo Smeaton scoring her 20th goal of the season for the hosts it wasn’t enough for Beacon Hill Rovers to get anything from the game as goals from Lily Halliday and Ellie Wood saw Southend United win the game 2-1. In Essex Women’s Division One, Dagenham & Redbridge Ladies are the 1st side to play out all their fixtures end their campaign leading the table by 3 points wasn’t to be more as they suffered defeat in their final league match at home to 3rd placed Hutton Ladies Reserves. Baylie Kingsnorth celebrating a brace, with a goal each for Vicky Kinsman and Cassandra Piejko plus an own goal in a 5-0 win. Dagenham & Redbridge can only wait and see what the chasing pack will do, a 3rd placed finish guaranteed at least, with both 2nd placed Billericay Town Ladies Reserves 3 points behind with 3 games in hand and 5th placed Rayleigh Town Ladies on 30 points with 7 still to play can overhaul them. Either way a great season for Dagenham & Redbridge Ladies. Hutton Ladies Reserves enjoying a strong season too have had a real impact on the title race. FC Clacton Ladies climb up to 4th in the Essex Women’s Division One table winning at home this Sunday against Chigwell Ladies. Goals from Jasmine Cox, Lauren Lucas and a 1st of the season from Sasha Moy securing a 3-1 win for FC Clacton. Victoria Parker getting on the scoresheet for Chigwell Ladies her 15th goal of the season. A home win too this Sunday in Division One for Chelmsford City Ladies taking on Belhus Ladies, goals from Kelsey Honeywood and Tish Cleary seeing Chelmsford win the game 2-1 to record their 3rd league win of the season enough to take them above Belhus into 9th place in the table. Bethany Murray scoring for Belhus. 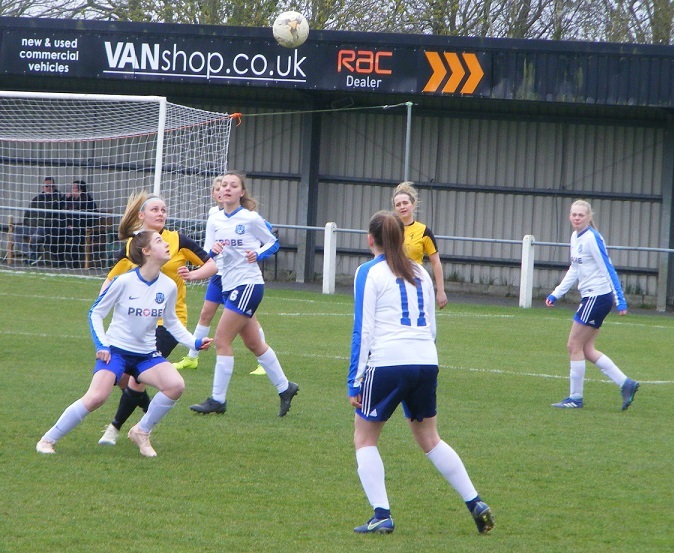 This entry was posted in Essex Women's Division One, Essex Women's League Cup, Essex Women's Premier Division, The Round-Up and tagged Essex Women's Division One, Essex Women's League Cup, Essex Women's Premier Division, The Round-Up on April 10, 2019 by WFEast.